volcanic eruptions in the Caribbean island of Montserrat not only affect its surroundings, but poses a serious threat to Edinburgh, the capital of Scotland. Scientists have found that whenever the disastrous tropical eruption takes place, Edinburgh suffers its worst winter storms. Alistair Dawson, an earth scientist at the Coventry University and Kieran Hickey at St Patrick's College in Maynooth, Scotland, conducted a comparative analysis of meteorological records of Edinburgh between 1770 and 1988 against the activities of volcanoes throughout the world ( New Scientist , Vol 155, No 2097). He found found that the Scottish capital, which is famous for strong winds, experienced most of the storms in winters following three major volcanic eruptions. Dawson says that for two winters after the eruptions at Tambora in April 1815 and Krakatoa in August 1883, both in Indonesia, Edinburgh experienced worst winter storms on 70 days a year. This was twice the usual frequency endured by the city every year. During March and April 1982, when El Chichon erupted in Mexico, Edinburgh had to experience furious storms for more than 50 days. While studying coastal flooding in Scotland, Dawson accidentally discovered the relationship between storms and volcanoes. The study focuses on Edinburgh because the wind records stretch back further than anywhere else in the Europe. The researcher says that if the findings are confirmed, it may force the United Nations' Intergovernmental Panel on Climate Change to reformulate their current theories about climate change. At present, they have suggested that North Atlantic may experience increased storminess caused by global warming. Dawson is of the opinion that volcanic eruptions should also be taken into consideration before devising such theories. According to Alan Robock, a meteorologist at the University of Maryland, usa, the findings might be a factor in the increased occurrence of stronger storms. He says that what Dawson has observed is a manifestation of the winter warming pattern discovered after major tropical eruptions. Dawson opines that the exact mechanisms by which volcanic eruptions increase the frequency of storms need to be investigated. 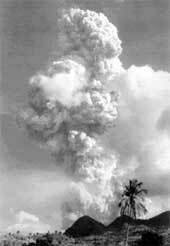 Fierce volcanic eruptions sometimes trigger large clouds of ash more than 20 km in the Stratosphere, which blocks the Sun. Stratosphere is the region of the atmosphere extending above the troposphere to a height of about 50 km, in which the lower part there is a little variation in temperature as against height, and in the higher part the temperature increases with height. Such process may cool the lower atmosphere, whereas increasing the movement of air between the equator and the poles. However, some of the experts feel that the news is not that bad for Edinburgh because it has been a normal phenomenon. They say that such winds frequently occur in the city. At the same time, the study of Dawson has shown that the frequency of strong winter storms in the Scottish capital dropped dramatically. It experienced an average of 22 fewer windy days a year in the 1980s than in the 1990s. So, the reason for this is still to be ascertained.